The Office of HIV/AIDS Housing (OHH) seeks your assistance to review and update as appropriate your grantee contact information on the Homelessness Resource Exchange (HRE) website. Maintaining current and accurate contact information is crucial to properly assisting individuals and their families seeking housing assistance and for other members of the interested public seeking information about the Housing Opportunities for Persons with AIDS (HOPWA) program. We ask that you take a few minutes to follow the directions below to ensure that we have the most up-to-date contact information. Please be sure to include grantee and all project sponsor contact information. Questions regarding this matter can be sent to Hopwa@hud.gov. 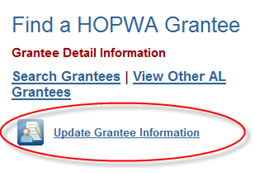 Grantees can submit updates to their contact information and project sponsors' information directly via the Find a HOPWA Grantee page under the HOPWA Programs, Grantees, and Reports section on the HRE by following the steps outlined below. 1. Select your state from the drop-down list. 3. Select “Update Grantee Information” link. 4. 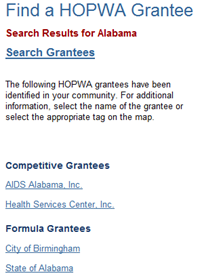 Enter the information requested, check the box certifying that you represent the HOPWA grantee, and select “Continue”. 5. Update the information that is incomplete or outdated and submit the updates. HUD will review updates you have submitted prior to having them posted on the HRE. Note: HUD will contact grantees directly via email if we have any questions regarding the updates submitted.